Newton B. 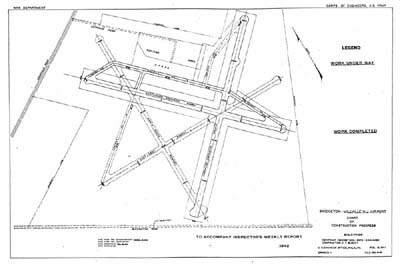 Wade, City Engineer, began to draw up plans, which were due November 20th. The plans took to the final hours and were flown the same day to the regional engineering division in New York by Rudy Chalow of the Millville Flying Club in order to meet the deadline. Several sites, including one in Wildwood, were being considered. City officials in hope to sway the decision towards Millville, contacted an old friend. Leon Henderson was a native of Millville and a graduate of Millville High School class of 1913. He served as an economist with the Russell Sage Foundation in the 1920’s and went to Washington in 1934 as the head of the Research and Planning Division of the National Recovery Act. His successful economic predictions during the depression made President Roosevelt aware of his talents and he was appointed to several key posts. 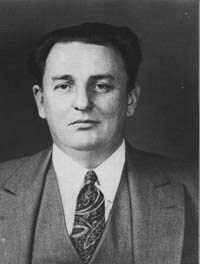 In May 1940, he was appointed to the National Defense Advisory Committee. The word came on December 12th, a forty million dollar airport construction and improvement plan would include $197,000 for construction of Millville Airport. A ground breaking ceremony on February 2, 1941 began the construction and the Millville Flying Club had its dream come true. In the months to come, they watched as an airfield emerged from the huge wooded tract and even made the first landings on the new asphalt runways. As completion neared, they planned for the dedication of the first of the “national defense” airports. As construction neared completion, August 2nd was selected for the great event. 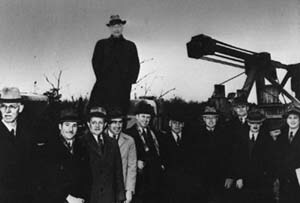 A dedication committee was formed with Gus Schick of the Millville Flying Club as the chairman. The committee made all arrangements for the dedication including inviting guests, printing of souvenir books and tickets, and designing the dedication monument, which was made by Anderson Memorial Works of Millville. The mayor of Millville proclaimed August 2 “Millville Airport Day”. All stores in Millville businesses except drug stores and service stations were closed from 1-5 PM in honor of the dedication. Administration (OPACS) administrator and native son, came from Washington to attend the event. Henderson recognized the efforts of the Millville Flying Club for their dedication to aviation and commended the community of people willing to “fight to defend themselves”. The Dedication ceremony was handled by Mayor Raymond F. Goodwin who delivered a forceful address followed by raising the flag. During the afternoon’s program at the airfield, Gus Schick, secretary of the Millville Flying Club and chairman of the dedication committee, was recognized, as was Joseph Genovese who assisted him. A thrilling air show by Sherwood E. Cole followed. Cole made a parachute jump from two miles up, and Dale Edgerton did some clever low altitude aerobatics. The two joined in a thrilling act of starting a stalled plane in mid air! Planes and trucks of the New Jersey Forest Fire Service demonstrated how forest fires were fought from the air and on the ground, using a two-way radio set. Approximately 35 planes visited the airfield during the day with private pilots taking part in several flying contests. That morning all of the flyers joined in a mass night over the county. The Millville Flying Club was never able relocate to the field they dreamed of. Several months after the dedication, Pearl Harbor brought war to the United States. The airfield was quickly taken over by the military and the flying club’s planes and many of the members were quickly absorbed into Army Air Corps training and the flying club eventually disbanded. 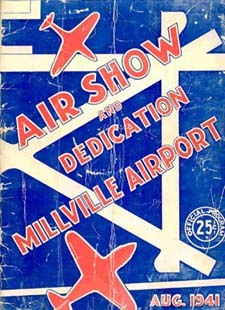 The Millville Airport was dedicated to American Defense and the Advancement of Aviation by the Millville Flying Club and the Millville City Commission. The determination of these aviation pioneers and many more like them, helped to prepare the United States for war and bring that war to a successful finish.